What is the definition of luxury? The answer can be somewhat fluid, to say the least. Ask 100 people on the street what luxury means and you will probably get 100 different answers. While definitions may vary from latest S Class Mercedes Benz to a pair of Christian Louboutin heels, they all return to the idea of value, what a person values in their life. Given that I write for this blog, it should come as no surprise that my response would have something to do with food. Let me dispel a notion. I enjoy the juicy goodness of thick, ‘black and blue’ ribeye or the rich, fatty flavor of pan-seared goose liver like any other person would. But for me, the meaning of luxury has nothing to do with price. It is all about the experience of food. Take for example, having lunch with a fellow food lover at I’m Angus Steakhouse and not ordering a steak. While Lori had a hefty ax of pork, I had a somewhat unusual order of Beef Tartare (P720). While many would find it repugnant to eat this dish of raw minced beef mixed with the pungent, tart flavors of onions and capers and aggressively seasoned with ground black pepper and Worcestershire sauce, I reveled in tucking into it. Over a hearty conversation about family, friends and of course food, I savored every mouthful. Eating your beef raw was a very primal, textural experience. I am a noodle fanatic. So as the days get cold and wet, I am always hankering to slurp a hot steaming bowl of noodles. I crave for my cold soba. I love my steaming ramen soup. I adore my pho. But my discovery of an Ilocano noodle dish might eclipse them all. They call it Pancit Musiko(P150). Served at Adarna Food and Culture, this dish is traditionally served to marching bands during local fiestas–thus, the name. These noodles are the definition of slow-cooking. It starts with a rich broth–enriched with the flavors from slowly (over a day, I am told) stewed pieces of pork and chicken and colored a deep reddish hue with achuete. Next, stubby custom-made egg noodles are lovingly nurtured into the broth. Cooking the noodles is a process of both give and take. 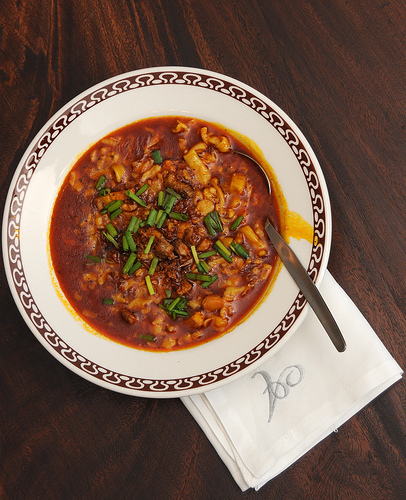 While the noodles imbibe the taste of the soup, its starches help thicken the broth. Why is this dish a luxury? Simple because in this world of quick and immediate gratification, very few cook food like this anymore. How about licking up a scoop or two of my favorite ice cream, Sebastian’s? I’m a nutty kind of guy. 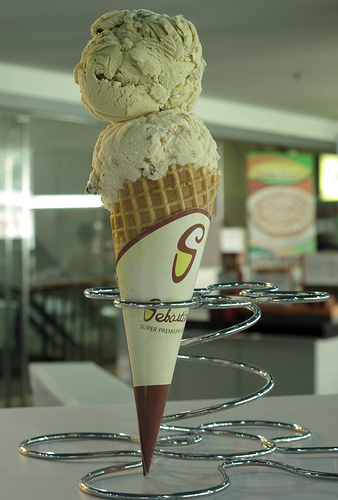 So having a scoop of Pistachio on top of Butter Pecan is not a difficult decision (P150 for a double scoop). The two flavors are distinct–a pale green, all-natural scoop decadently peppered with toasty pistachios and a smooth, buttery serving chockfull of crunchy pecans. And yet they are similar in their uncompromising creaminess and their rich depth of flavors and textures. Did I fail to mention the size of these scoops? They are so hefty that I could hear my waffle cone crack under the strain of their weight. Consuming the double scoop quickly was luxurious necessity that I would have no problems fulfilling. So you can keep your It bags and fancy, Swiss watches, I’m off to savor all the wonderful tastes and textures the food world has to offer. Care to come along? Thanks to Erik Lacson for the amazing Pancit Musiko photo. I want that pancit!!!! Like you I am a noodle lover, and enjoy slurping pho, cold soba with tons of wasabi, steaming hot chewy udon soup with tempura crumbs floating in the broth, and of course, Cantonese wonton noodle soup with the thin egg noodles. Would you believe my first taste of steak tartar was at a Korean resto here? It was mighty good! Hi Paul. Like I said, right now my definition of luxury has really shifted from brands and price tags to appreciating the time and care that gone into the making of the food I enjoy. Sometimes, having treats that you know you shouldn't have too much of can be the ultimate indulgence: a bag of chicharon, a double scoop of ice cream, a mountain of french fries. In the end, your definition of luxury really is a reflection of what you place value in or what you desire. I was so thrilled that Sebastian's finally opened in Makati that I headed over as soon as I could, and got a scoop each of the Peanut Butter Cookie Dough and Peanut Butter Cookies & Cream. I have a feeling I'll be watching movies in Glorietta more often. We were in a resto here in France yesterday and their Steak Tartare was this disconcerting lump of ground beef. Egad. Looks like there are SO many new places to try out in Manila. Looking forward to it. Home in a week! Thank you so much for mentioning us, Franco! We are always flattered and humbled by such wonderful complements. It makes what we do all worth it and drives us to develop even more flavors and ice cream ideas for people like you who "get" and appreciate what we do. Steak tartare - my favorite dish. 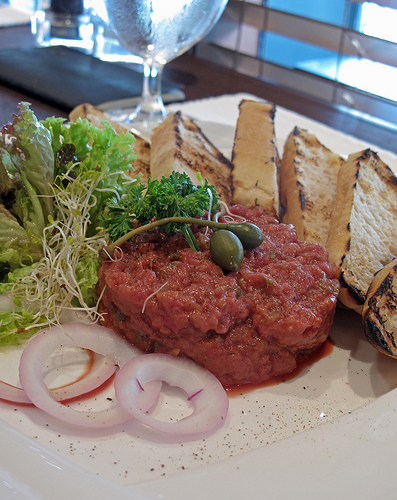 I've tried many in Manila and my favorite is the tartare in Antonios..